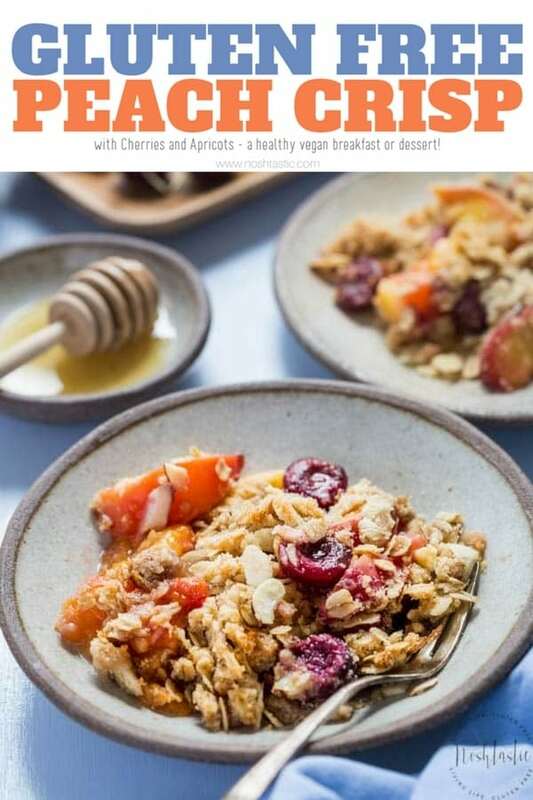 This is a really delicious Gluten Free Peach Crisp with Cherries and Apricots and topped with a tasty almond flour and oat crisp, it’s a great healthy vegan breakfast or dessert! 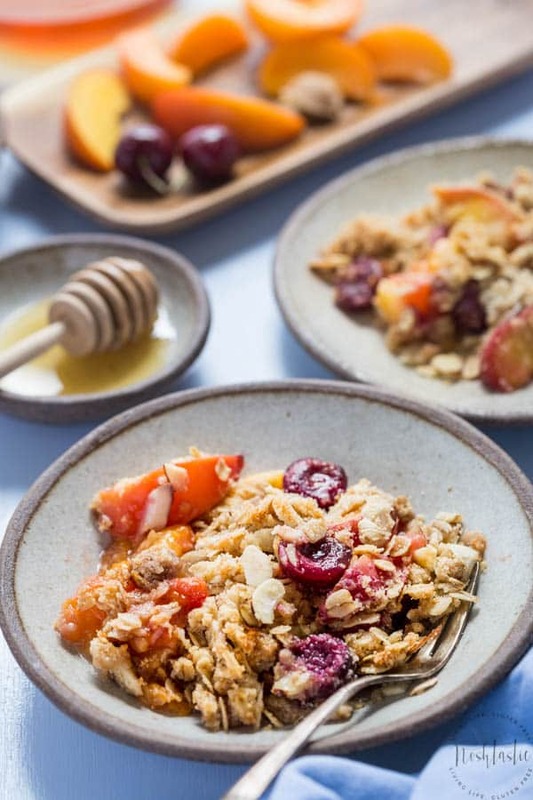 What’s the difference between a fruit crumble and a fruit crisp? Coming from the UK I’d never heard the term ‘fruit crisp’ before, we mostly just have crumbles over there so I wanted to know what the differences were. Perhaps I should start with the similarities! They are all baked desserts with various fruits such as apples, peaches, and cherries to name a few. My version has a combination of quick cooking gluten free oats and almond flour for a really crispy, tasty topping I know you’ll love. I might sound like a broken record, but this really is a very easy recipe to make and is one that I love to make with my kids. It doesn’t require precision in the same way that a baking recipe would so it’s really just a matter of prepping the ingredients, mixing them, and then baking it in the oven. Here’s some simple step by step instructions, the full recipe is at the end of the post. The first step is to choose the fruit you want to use. I’ve made this several times and tend to buy whatever looks fresh in the grocery store, for the version you can see in the photos I’ve used cherries, apricots, and peaches, and they tasted fantastic in combination. Start prepping the stone fruit by removing the stones and pits, this is the most time consuming part especially if you are using cherries! While you are prepping the fruit, turn on the oven to 375F so that you will be ready to cook. 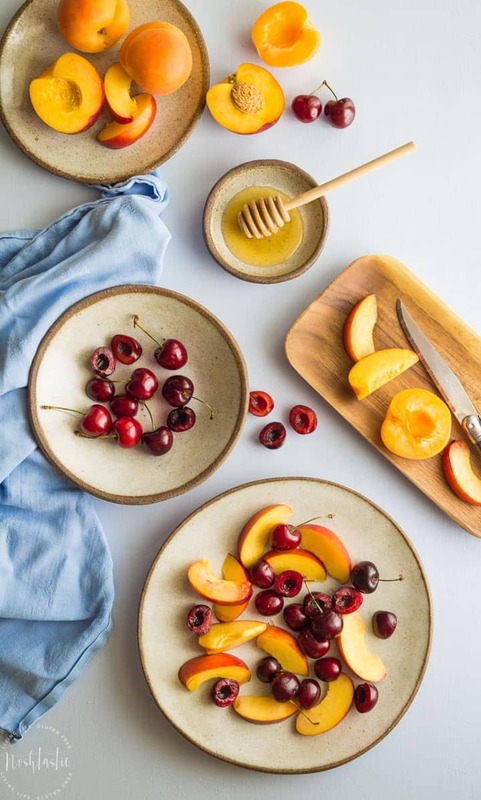 Now it’s simply a matter of combining the prepared fruit with the orange juice, coconut sugar, cornstarch, vanilla extract, salt and mixing well in a large bowl. The addition of a little cornstarch just helps thicken up the lovely fruit juices as it cooks. Next you need to combine the oats, almond flour, almonds, cinnamon and salt into another bowl. Then add the maple syrup, coconut oil, and vanilla extract and combine. The last step is to add the fruit mixture to a 2.5 quart baking dish, or an 8 inch square pan and evenly spread the crisp topping over the fruit. It may not fully cover it and that’s ok! Bake it for up to 30 minutes, or until the top is a little brown. We love to serve it for a healthy breakfast as it is, or for dessert with vanilla ice cream or custard. If you’re looking for some more recipes for your family please check out my recipe index. If you’re looking for another breakfast idea then be sure to check out my recipe for Paleo Pancakes, it’s made with Almond flour and is a great healthy grain free and refined sugar free option. Or How about another Gluten-free apple Crisp? This one from Texanerin looks lovely! Have you ever tried Chicken Biryani? It’s a wonderfully flavorful rice based dish that I know you’ll love, it’s not too hot so your kids will love it too. And lastly what about trying my Paleo Balsamic Chicken Salad with a lovely Creamy Dairy Free Strawberry Vinaigrette! It tastes great! 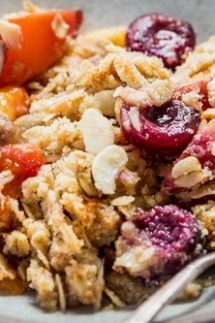 This is a really delicious Gluten Free Peach Crisp with Cherries and Apricots and topped with a tasty almond flour and oat crisp, it's perfect for breakfast or dessert! Wash, pit and slice the fruit into one inch wedges. Put them into a large mixing bowl, add orange juice, coconut sugar, cornstarch, vanilla extract and salt then mix well. For the topping combine the oats, almond flour, slivered almonds, cinnamon, and salt into another bowl. Then add the maple syrup, coconut oil, and vanilla extract and stir well. Pour the fruit mix into a 2.5 quart baking dish, or an 8 inch square pan and evenly spread the topping. Bake on the middle rack of your oven for 30 minutes until the top is crisp and browned. Allow it to cool a little, then serve hot as it is or with ice cream or custard. 1. Recipe adapted from The Sprouted Kitchen Bowl and Spoon 2. 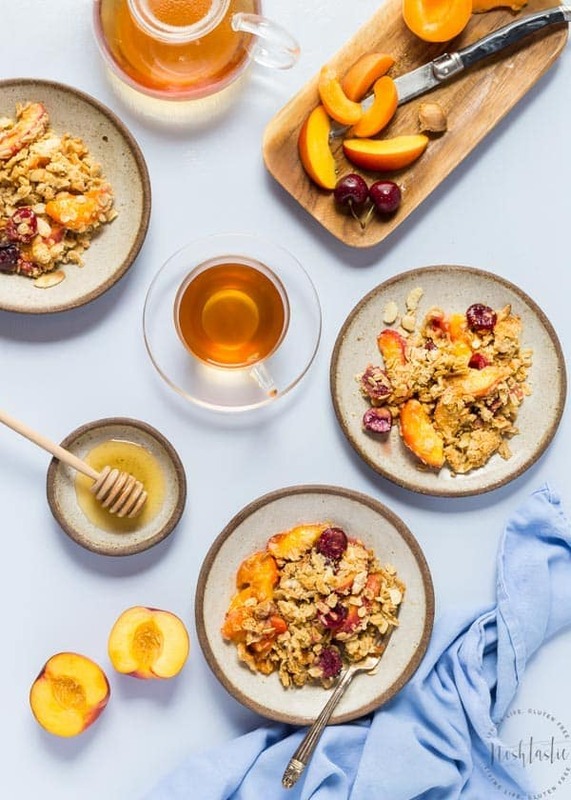 Nutrition facts are approximate and based on using peaches only, they will differ depending on the fruit you choose and the different brands of oats and other ingredients used.